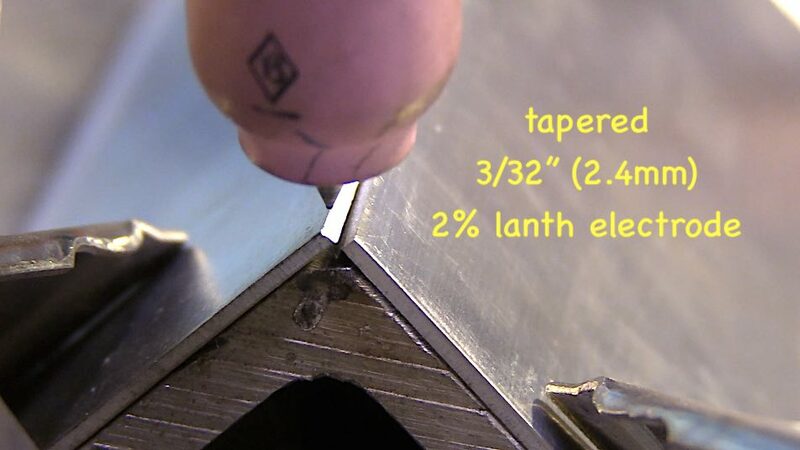 This page is about How to TIG weld 16 ga aluminum outside corner joint. Start off with clean aluminum. Sometimes a simple wipe with alcohol or acetone is sufficient…other times a clean stainless wire brush helps. And sometimes when the aluminum is heavily oxidized , and abrasive like a flap disc is needed. It really all depends on the application and there are certain stringent applicants where a part will be inspected by x ray, where only clean carbide burrs can be used due to the risk of embedding abrasive particles in the aluminum. Fit up is key. Corner to corner with no gap is what is called for for an outside corner joint in 16ga aluminum. I used a piece of aluminum angle block as backing to remove some heat from the piece…otherwise a small aluminum weldment will saturate with heat and will weld strangely. After making a small tack weld on each end, the piece is ready to weld. I recommend several tack welds on real world parts. Imagine this small weld being on a larger expansion tank with several 90 degree breaks. You would most likely need a tack weld every few inches. 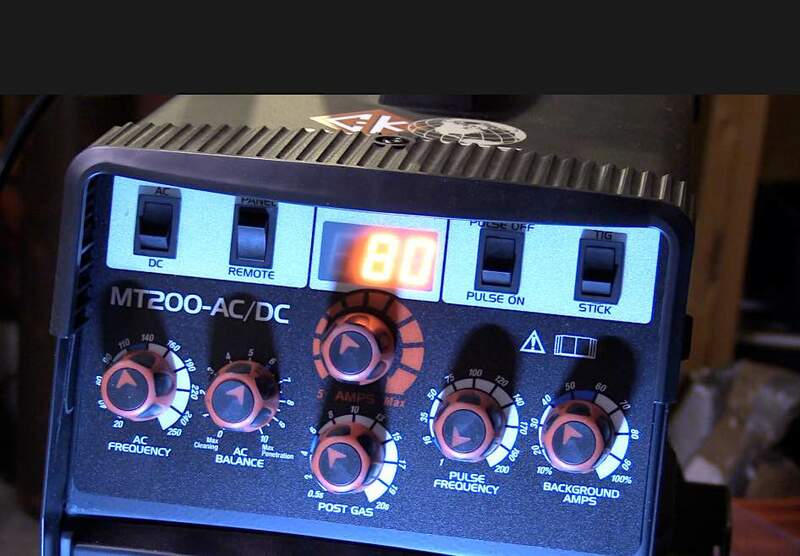 80 amps using a foot pedal. Without the heat sink, this weld could easily be done with 60-65 amps. Filler metal selection for 6061 aluminum usually depends on several factors. Will the aluminum be heat treated after welding to strengthen it? 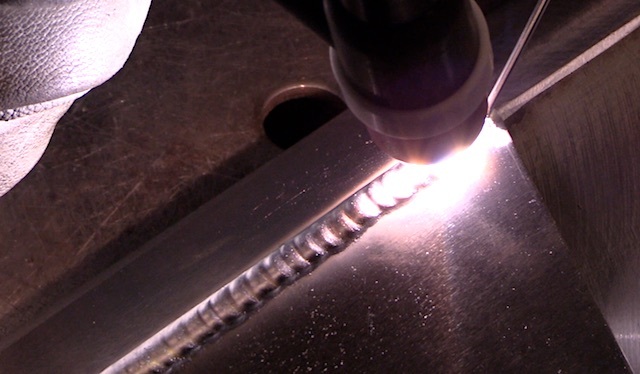 4043 and 5356 are the 2 most commonly used filler metals for tig welding 6061 aluminum. But neither one of these filler metals can be strengthened appreciably by heat treatment. 4943 alloy will respond to heat treatment and so will 4643. Certain critical or coded welds should have a procedure that has been qualified and approved by an engineering authority. 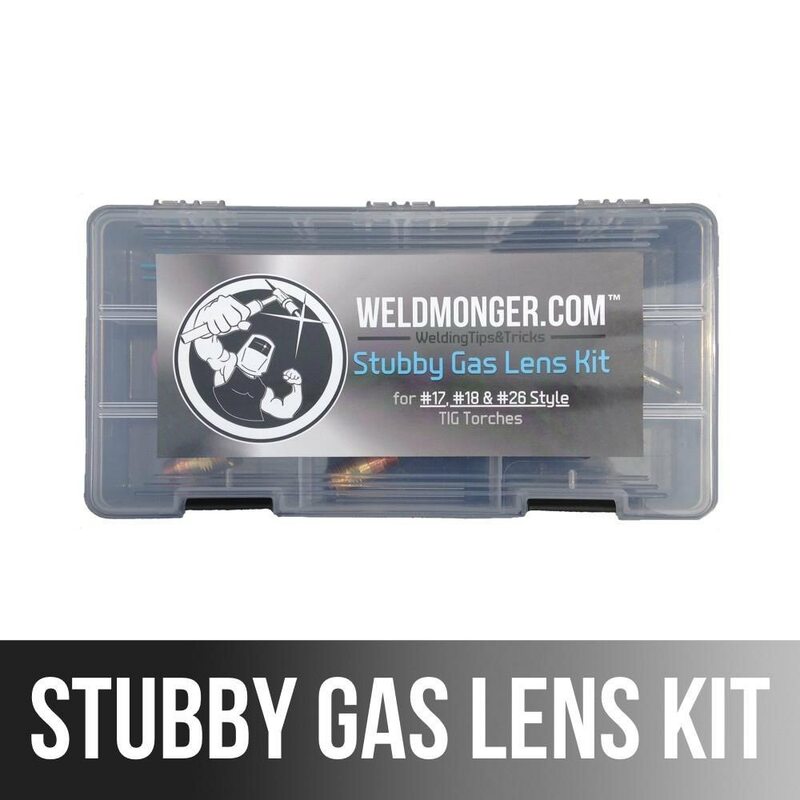 Will the weldment be subject to an anodized coating? 6061 is often welded with 4043 filler but when the job calls for an anodized coating after welding, 4043 welds will turn black. 5356 filler is a much better choice when welds will be anodized and cosmetics are an important factor in the end product. Will the weldment be subjected to temperatures above 150f in service? There are many applications where an aluminum weldment might be subjected to fairly high temperatures during service. One example would be an aluminum aircraft engine part where not only does the part reach temperature above 150f but also experience stress and vibration. Even though 6061 aluminum can be readily welded with 5356 filler and the welds are typically stronger than welds made with 4043 filler metal, magnesium in the 5356 filler metal can react with the silicon in the 6061 and at temperatures above 150f can set up a crack susceptible area.